Vatican City (Agenzia Fides) – This morning, with greetings from Cardinal Fernando Filoni, Prefect of the Congregation for the Evangelization of Peoples, and the Eucharistic concelebration presided by the Secretary of CEP, Archbishop Protase Rugambwa, the Study Seminar for the Bishops recently appointed in the ecclesiastical circumscriptions dependent on the Missionary Congregation began. 74 Bishops from 34 nations of four continents: 17 nations of Africa, 8 of Asia, 6 of Oceania, 3 of Latin America arrived in Rome at the Pontifical College of Saint Paul the Apostle, where the Seminar will be held. The Study Seminar, which started in 1994, wants to offer all the Bishops appointed recently at the guide of ecclesiastical circumscriptions in mission territories, a period of time, at the beginning of their appoinment, to reflect, deepen the life and Episcopal ministry, dialogue and pray. This is why the speakers are authoritative ecclesiastical personalities. The timetable provides three daily reports, followed by discussions and group work. On Saturday, September 8, after the concelebration in St. Peter’s Basilica, an audience with the Holy Father will be held and on Sunday 9 the Bishops will go on a pilgrimage to Assisi. On the evening of Monday 10 there will be a meeting with the new Bishops of the Congregation for Bishops. The seminar will end on Saturday 15 September. The program of the Seminar includes the speeches of His Exc. Mgr. Protase Rugambwa, Secretary of the Congregation for the Evangelization of Peoples, who will present the theme “The Bishop of mission territories and the CEP”, and of His Exc. Mgr. Giovanni Pietro Dal Toso, Adjunct Secretary of the Missionary Dicastery and President of the Pontifical Mission Societies, who will illustrate the “structures, skills and activities”. The program of the Seminar includes presentations of Cardinals: Lorenzo Baldisseri (Synod of Bishops and Episcopal Communion), Kurt Koch (Ecumenical dialogue and presence of sects in mission territories), Angelo Amato (Bishop’s Spirituality), Peter Turkson (Social Doctrine of the Church and Evangelization), Marc Ouellet (The Pope and the Bishops: communion and mission), Kevin Farrell (Formation of families for the participation in the mission of the local Church), Luis Ladaria Ferrer (Exercise of the munus docendi), Beniamino Stella (Paternity towards priests and formation of the clergy) will intervene. 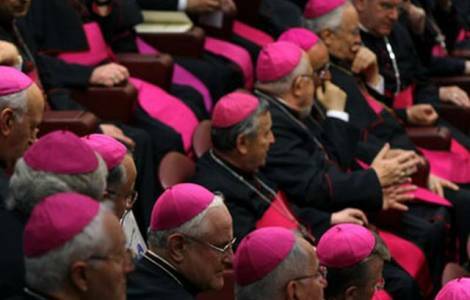 José Rodriguez Carballo (Care of Consecrated Life), Juan I. Arrieta (The Bishop in charge of pastoral programs; Motu proprio Mitis iudex Dominus Jesus), Charles Jude Scicluna (Celibacy of the clergy and ecclesiastics accused of sexual abuse), Richard Kuuia Baawobr (Catechists in mission territories) will take the floor.